is not Cabo San Lucas. No time-shares, no strip clubs, no jet skis, no beach vendors, and no traffic. Just a relaxed style of living that is very hard to find in the hectic 21st century. Underneath the town’s sleepy exterior there exists a vibrant microcosm of many activities you might find in any city. In 1724, the town was founded as a mission and later became a major sugar cane producer. Todos Santos has always been considered a special place, as reflected by its live theater, art galleries, centers for workshops and seminars, and historical homes. Todos Santos boasts high-speed Internet cafes, access to wireless networks, DSL and satellite connections. But, primarily, it is a place for people to find peace and to pursue individual self-expression. Local legends abound. Rumor has it that the ex-pat Gringo “vibe” of Todos Santos was created by an exodus of artists from Sante Fe, New Mexico nearly 20 years ago. The well known Charles Stewart and his Cherokee Indian wife Mary Ann, rolled into town some twenty-five years ago seeking peace and refuge from the exploding tourist art communities of Santa Fe and Taos, New Mexico. Stewart, now in his eighties, paints dreamy paintings loaded with American Indian symbology heavily influenced by the surrealist movement of the 40’s, was associated with that migration. Reportedly, they felt that their town was becoming too commercial. A walk through the town seems to confirm this story. Combine miles of pristine beaches (which are increasingly becoming a Mecca for surfers), with the sweetly growing ambience of a Baja village relatively unspoiled by tourism and turned artistic and throw in some local heart and the recipe could be unparalleled. Long known as a cultural, artistic and agricultural center, the town is a desert oasis, one kilometer from the Pacific Ocean at the foothills of the Sierra de la Laguna Mountains, on the Pacific coast side of the Baja California Peninsula, about an hour’s drive north of Cabo San Lucas on Highway 19 and an hour’s drive south from La Paz. The location of Todos Santos is 23°26′56″N 110°13′32″W, very near the Tropic of Cancer at 23° 26′ 22″ N in the municipality of La Paz. The population was 4,078 at the census of 2005. During the 19th century Todos Santos thrived as the Baja sugarcane capital, which is still evident by the ruins of sugar mills. Now the rich farmlands have been re-worked & the town prospers from an abundance of vegetable& chili farming, avocado, papaya & mango orchards, fishing & ranching. The mission Nuestra Señora del Pilar de La Paz was founded by father Jaime Bravo in 1723. It is located across the street to the southwest from the small town plaza. This mission contains the statue of the Virgin of Pilar, which is the focus of Todos Santos main festival in October. More recently, there has been a gradual increase in tourist activity and a boom in real estate development. Handicraft shops, owner-operated art galleries featuring landscape paintings of local scenes (some artists from Guadalajara and other parts of Mexico also exhibit works in Todos Santos,) upscale restaurants, boutique hotels and restored colonial buildings have contributed to the gentrification and redevelopment of the town. 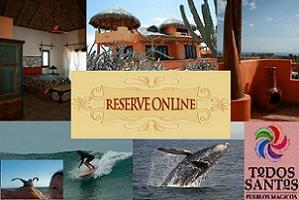 There are many beautiful beaches within a 30 minute drive of Todos Santos. However, some of the area’s beaches, with rip tides, undertows, and fairly steep drop offs that are close to shore, are not considered safe for swimming. Playa Las Palmas and Playa Los Cerritos are great beaches for swimming and shell collecting, and Los Cerritos attracts surfers from around the world. Todos Santos, Baja California Sur, was named a “Pueblo Mágico” in 2006.